Valentine's Day is near and we are celebrating with 20% off select items, plus free standard domestic shipping! There is still time to order your one of a kind Halloween accessories and costumes! Stand out this Halloween and wear handmade! 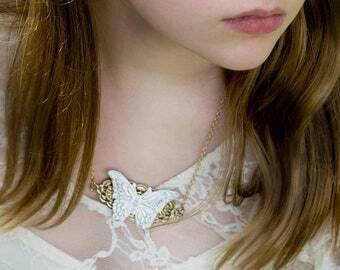 Lovely new butterfly necklaces are now available. A mix of vintage and new supplies! The best of both worlds! 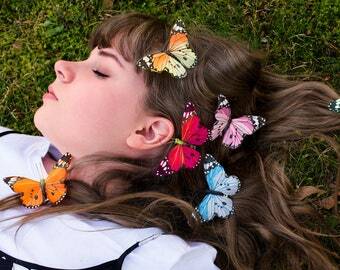 Because fairies are real and they need cute hair accessories too! 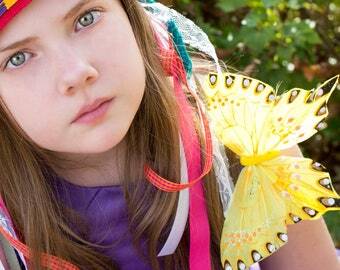 All of our fairy and flower fascinators are now on sale through September 7th plus free standard domestic shipping! Labor Day sale! 20% off select items in each department, plus free domestic shipping! Made to order and custom items not included. No minimum purchase or coupon code required. Sale ends September 7th, 2018. My third magazine feature for 2018! Thank you Handmade Business magazine for featuring my shop. The Halloween potion bottles in the spotlight are available just in time for Halloween! Another one of my jewelry pieces was featured in Jewelry Affaire magazine last month! 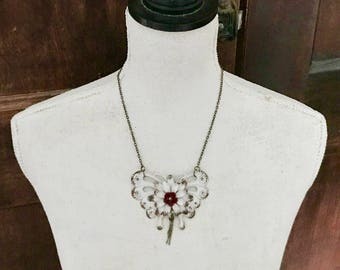 This leather statement necklace features nearly 100% upcycled materials. Lovely butterfly hair clip sets are available in various styles and numbers. They can be worn together or individually. 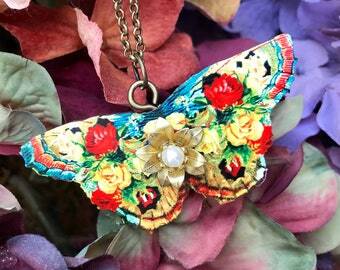 This lovely butterfly statement necklace was featured in Jewelry Affaire magazine this month. You can pick up the magazine in craft stores or wherever books are sold, and you can pick up this necklace in my shop! 300 beautiful and unique items are available in my shop right now and more are being added daily. One of a kind and made to order items fill the shop with eye candy and shopping fun. 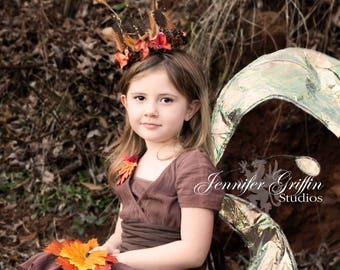 Take a peek at all of the new crowns and headpieces that are available. The first collection of Spring is here! My Rainbow Roses Collection features 3 distinctive but coordinating pieces. A full headdress, an antler style tiara and a fascinator clip. All 3 pieces feature the lovely, high quality silk rainbow roses pictured. Get ready! The new spring and summer lines are coming soon. They will have 2 release dates, February 12th 2018 and March 1st 2018. We recently got 8” of snow here in the south! It was the perfect opportunity to photograph some of the winter headdresses and crowns. There are several designs to choose from. There’s bound to be a perfect one for you. If not, I can make a custom piece. 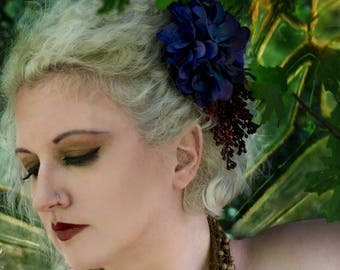 Working on some original fine art photography that have hand painted details. They are so lovely! 25% off all steampunk shop sections! Now through December 17th take 25% off your steampunk order! No minimum purchase. Taxes and shipping extra. No coupon code required. Discounts have been applied to items included in the sale. If you are like cal to the metro-Atlanta or city of Atlanta area, then stop by one of the best local breweries for the Small Town Creative’s Holiday Pop-up Shop. Jennifer Griffin Studios will be there! Unique gifts, beer and food trucks! A peek into my studio. As you can see it’s cram packed with stuff but it’s well organized! Creating some custom Queen of Hearts fascinators based on an existing design listing. I have several vintage playing card fascinators ready to ship! Finishing up some orders for my moss hair clip sets. These are so versatile and unique. Perfect for fairy costumes for Halloween! 4 species of moss are used in these moos hair clips. And each set is individually handmade so no 2 are alike. Nearly finished with these lovelies. Hand sculpted shoulder epaulets. Moss as far as the eye can see! These moss hair clips are one of my best sellers. Beautifully unique, they come in various colors. I am pre-making my most popular flower color, white. So there will be no waiting for these, they will be ready to ship. Setting up a photo shoot with these lovely butterflies. They are a large version on my 3" clips. These are double the size at a 6" wingspan. Just finished up this fabulous mens, woodland, tree bark and moss crown. Each of them are completely different and unique.